The latest BABS Master List Update is now online in the Members Only CONTROL CENTER. Our goal in playing this game is to try to find players whose productivity exceeds our investment. Player projections attempt to place a metric on productivity; ADPs and AAVs attempt to show us how others are investing. These two lines of thought are often at odds and tough to reconcile. One of the great things about the Broad Assessment Balance Sheet (BABS) is her ability to group like-skilled players and show how the marketplace values them. That provides a single-lens view of potential profit. All three have the same basic skills set – moderate power, significant speed, significant batting effectiveness (our proxy for batting average). Given the wide error bars of statistical volatility, they are all very similar in underlying skill. Despite their similarities, none of them is without some risk. With less than two full seasons in the majors, Turner (pictured) is an Experience risk, which means the error bar around his projection will be exceedingly wide. He is also a Regression risk after his other-wordly, out-of-character performance last summer. Pollock is an Injury risk coming off a season in which he saw only 46 plate appearances. Dahl is another player with major Experience risk. In most cases, it is your risk assessment, or risk tolerance, that shapes the value you place on players. In the world of BABS, you have a risk budget, so any of these three could conceivably fit nicely onto your roster. You could justify passing on Turner and taking your profit by waiting for Pollock or Dahl. Remember, all three have essentially the same skills set based on the information we have at the moment. In a nutshell, that’s how BABS works. There are asset groups of comparable commodities up and down the entire player pool. There are groups of 2 and 3, but also deep groups of 15 and 20… all composed of essentially interchangeable players. BABS will find you reasonable, less expensive alternatives to everyone from Kris Bryant and Buster Posey, to Jake Arrieta and Kyle Schwarber. In fact, Posey was in the same asset group as the less expensive Jonathan Lucroy last year – that worked out pretty well. So, the immediate impulse would be to identify all these asset groups and target all the lower-ranked players. If you can get a 2nd-rounder in the 6th round, you set that target. If you can pass on a $29 player in lieu of a $18 sleeper, you do that too. The more of these you find, the more profit you can build into your roster. Profit is good. But that can be a dangerous path. Taken to its most extreme, you could target all $5 players who would be expected to generate $25 dollars of value. That would yield $575 of value while costing you only $115. Great job! But you have $260 to spend. Building your roster on draft day is very similar to deciding on your protection list in keeper leagues. You want to have a balance between players who are the best values and players who are just plain valuable. Any rating over 20 has to be someone you consider keeping. So a freeze list with only $11 players expected to earn $20 is not going to get the job done. And a draft roster with only profit chasers is going to fall short as well. One might think that snake drafts mitigate this problem by forcing you to choose a player in each round. But that’s not what we see. Whether we recognize it or not, picking Bryce Harper in the first round is a profit-chasing pick. His risk profile would urge caution but that’s not how he’s being drafted. Trea Turner is the same thing. Whenever you reach for a player in rounds earlier than their ADPs, or rounds earlier than their true potential, those are profit chases. They prevent you from drafting at-par players in their value-appropriate round. It would be all well and good if we could guarantee that those chases always pan out, but that’s not the case. Profit-chasing is risky. If we knew for a fact that David Dahl would be worth as much as Trea Turner this year, we’d be paying more for that enhanced certainty. The ADPs provide some level of sanity check even if they are far from exact. As it turns out, BABS is all about balance – see page 59 in the eBook – and it’s even a part of her name. So go ahead and use her to find pockets of profit. But don’t forget that your roster still needs a solid foundation of stable commodities at fair market prices. Am I reading that right by basing projected value on BABS groupings (Fowler in the 30-40 group) where Hamels is in the 10 to 20 group? Or are you using the projected Auction dollar amount? Sure, you can do that. When I started using that formula – probably ~20 years ago now – we were using more granular projections, making it somewhat more precise (or at least I thought so at the time). But this is really just a rough, back-of-the-envelope calculation, not a be-all or end-all. I do believe that the word “precise” is a swear word to BABS…. I’m new to this. Where do you see Fowler’s projected value at $35 and Hamels at $15? Join the site or buy the eBook, and it will become crystal clear. The green bars on the BABS master list represent $10 ranges of potential earnings. The top range — $35 — really encompasses all players who could earn $30 and up. The $15 bar are players who could earn between $10 and $20. I have 8th Overall Pick in new 30 Team H2H Points Dynasty League. I know you are big at picking closer to the wheel. Do you think moving from Pick 8 to Pick 15 in the 1st Round while picking up an extra 3rd Round pick is a good move? Would give me four picks in the Top 75. I am hoping the time you took to write me here did not put you at risk of losing out on this opportunity. What are you waiting for?? When using projected value is that inflated value or without inflation? Needs to be the inflated value. What you $20 target if you were in a 4X4 AL only league? The Master List at http://ronshandler.com/members-control-center/ contains all the players. 4×4 doesn’t matter because it’s all about skills. Ron, you often refer to “risk budget” and I;’m not sure how to quantify that. The draft worksheet indicates a budget of “4” in experience for a 15 team, mixed league. The budget does not make a distinction. “EX” and “e” are the same. “INJ” and “inj-” are the same. But of course, if you filled your allowable Liabilities with all “INJ” players, you’d be in a lot worse shape. I am confused about the “minimums” set by BABS. For a 12 team mixed it is 14 Pw, 8 Sp, 14 Av. Even if we count P+ and S+ as two I can’t see how you get to both the Pw and Sp minimums. I just drafted a mock using BABS and got to 13 Pw and only 5 Sp. Av is not an issue as there a lots of players that contribute in that and another category. However, the number that contributes to both Pw and Sp is very few. Further, every P+ or S+ we draft to make up a skill will always come at the expense of the other skill making the need to draft another elite skill player in the other category, which leaves another skill to make up for, etc… The team I drafted I think is okay except it is light on pitching which is scary if I don’t even have the league average in Pw and Sp. Can I get some guidance on what I may be missing? Thanks for all the work you do, super interesting concept. It is doable, but I won’t deny that it’s a challenge. In particular, these days it will be difficult to meet the Speed requirements. Speed was always a problem because catchers and corner-infielders don’t steal much, but the number of speed-only and power-only players has increased this year, making it even more difficult. I’ll admit that it’s barely doable in a 15-teamer but you should have an easier time in a 12-team mixed league. Taking my first dive into a H2H Categories league this year. 12 Team Mixed. Hitting categories are AVG, R, SB, K, HR, RBI, OPS, and BB. Pitching is ERA, WHIP, SV, L, K, W, QS, CG. I am curious if there is a strategy best tailored to this format besides building a complete roster (i.e. loading up hitting and only starting RP). The winning team last year won 55% of the categories during the season (the rest were divided between losses and ties). Do you see a strategic way to construct a roster in order to give myself the best chance at winning 55%+ of these weekly categories during the season, or is balance the best way to go? So many categories and so much overlap! That makes it difficult to dominate in just some and not all. Sure, you could punt saves and steals – the most isolated cats – but I suspect the winning team in your league just got lucky last year. I look at it this way… Drafting a balanced team gives you a 10% chance to win by 1-5 games. Drafting a skewed strength team gives you a 2% chance to win by 10+ games (and often an inflated risk of finishing closer to the bottom). Ron – I always learn more listening/reading you. I do have a question about your keeper formula. You suggest Trout at (45-47)+45=43 is a sound keeper (much greater than your 20 threshold). I agree that Trout would anchor any team, but if I can get him back in the draft at about the same as my keeper price, why should I keep him (and use up one of my keeper spots) and not just re-draft him. I could keep some other player with a much higher profit figure instead. Always interested in your thoughts. The keeper formula is just a rough, back-of-the-envelope tool to do a first-pass filter. But certainly, you have to make your decisions based on the context of your league. The pure definition of a keeper, essentially, is any player who you could not get back in the draft at his current price. So sure, toss Trout back if you wouldn’t have to pay more for him at the draft. Ron, is there a chance Trea Turner exceeds his projected walk rate that various outlets are projecting? 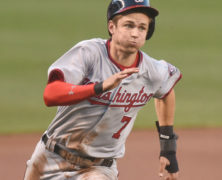 I noticed that he had a solid walk rate in the minors (higher than the paltry one he exhibited last season with the Nationals). Do you feel that pitchers will pitch around him more carefully now leading to him taking more pitches or walks? I guess I’m wondering if he can elevate this skill (I play in a OBP/BB league). I don’t know. Anything is possible. All we have to go on is a small sample of performance compiled against sub-par Aug-Sept competition (39 of his last 49 games were against sub-.500 teams). If he couldn’t elevate his walk rate against them, then…. Good point – thanks for the input!